Prepare hundreds of different types of dishes from a variety of cuisines in this excitingly fast-paced time management game, Cooking Fever! Serve your customers as promptly as you can, and hopefully, you can earn some extra tips in return for the good service. Reinvest your profits back into your restaurant to improve your efficiency and maximize your profits. Show them you’ve got the chops to become the best chef there is in Cooking Fever! 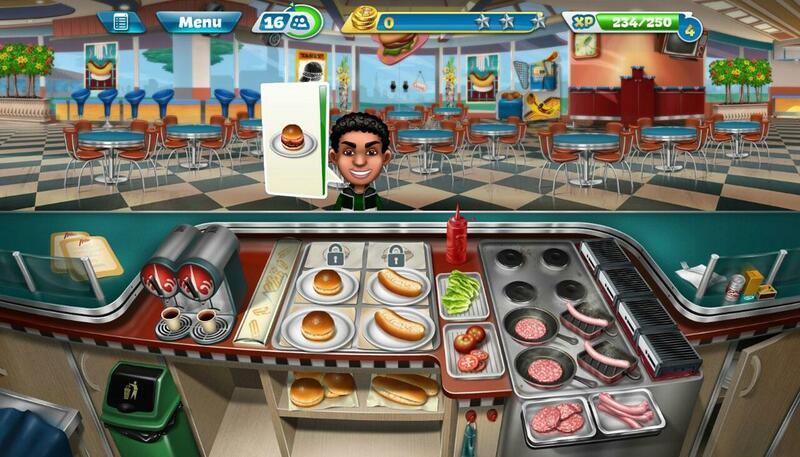 The game sets you up with a quaint little diner to give you a good start. Here, you’ll be able to learn how to play the game via the helpful tutorial. 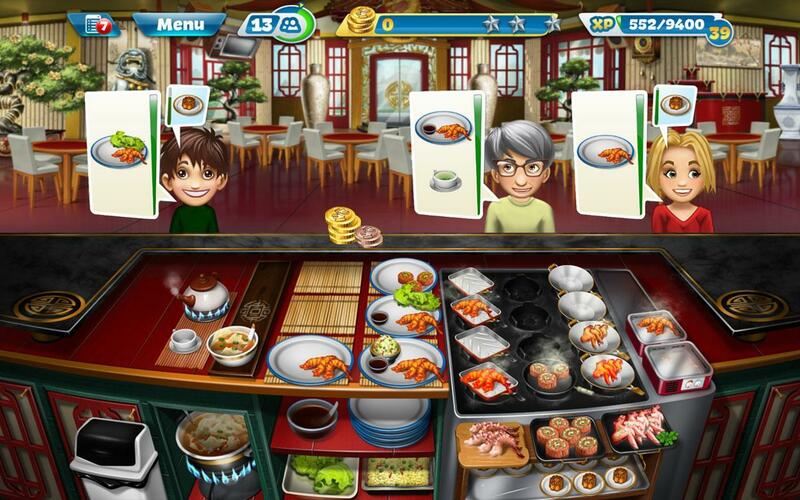 Basically, the game is very much similar to most cooking-themed time management game whereby you’ll be provided with a nice range of ingredients, such as burger patties, and hot dogs, which you’ll need to prepare for your customers. There are also “add-ons” that your customers can order, such as lettuces, tomatoes, a variety of sauces, as well as other side-dishes like fries, and soda. All of these dishes, including whatever side-dishes your customers want, must be delivered to the respective customers before their patience run out. You can see how much time you have left by referring to the meter right next to customer order. Once the meter dropped to yellow or red, the amount of tips that you’ll get will be greatly reduced. Of course, if you waited for a bit too long, your customer may just storm out of your diner in anger, leaving you with only a pittance. In Cooking Fever, there are many ways you can prevent just that. One of which is by purchasing kitchen upgrades. Granted that these upgrades won’t affect your customers’ patience level, having an extra tabletop area or a new frying pan may work wonders to your productivity and efficiency as a virtual chef. By combining these kitchen upgrades with some interior upgrades that will relax the customers, making them a bit more patient than usual, and you’ll be able to easily earn 3 stars per level even for the tougher levels. Talking about stars, each level you play in Cooking Fever corresponds to 1 in-game business day and each of them allows you to earn up to 3 stars. You just need a minimum of 1 star to proceed to the next level, but of course, if you can get 3 of them, you’ll get a nice boost to your total profits for that level. Hence, naturally, you’d want to get as many stars as you can. There are also tasks that you can complete by playing levels or buying upgrades. However, as these tasks only offer a relatively small amount of in-game cash and experience points as rewards, it might not be beneficial for you to try to complete them. You’d be better off replaying a level – you’ll earn more cash and experience points that way. As you’re managing a diner at the beginning, the dishes that you can prepare are generally limited to fast food. However, as you progress, you’ll unlock new restaurants and shops such as the bakery, the oriental restaurant, the pizzeria and more. New restaurants you’ve unlocked will need to be purchased using both in-game and premium currency before you can actually access them. Now, before you start yelling “paywall”, it might be good to note that premium currency (gems) can be pretty easy to come by as you’ll get some via finishing certain tasks, completing achievements, and also by leveling up. However, it is still wise to save up as many gems as you can. If you want, you could also buy more gems using real money. In terms of graphics and sound, Cooking Fever excels in those areas as well. The food items are so beautifully designed to the point that they are absolutely drool-worthy. The sizzling sound of frying patties or the trickling sound of tea being poured, for example, also adds to the immersion of the game. 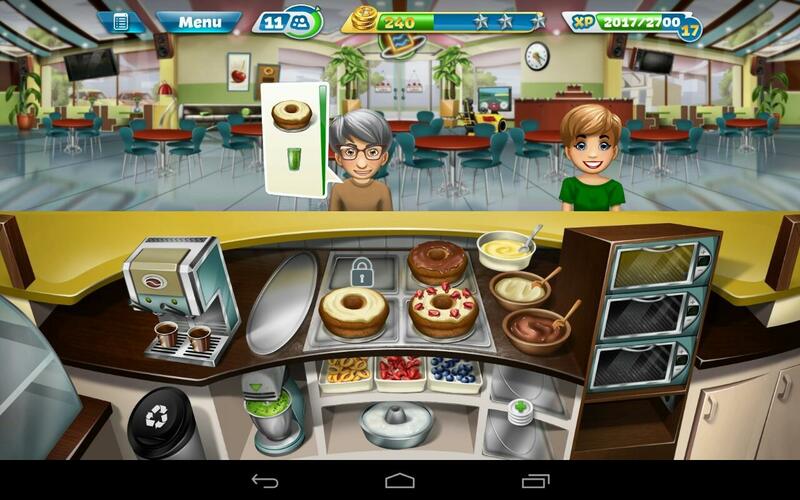 Not to mention, Cooking Fever, being a time management game, is incredibly addictive to play. So, if you’re a huge fan of time management games or cooking games, Cooking Fever is definitely a game you wouldn’t want to miss out! Try it out on your Android or Apple devices today!